Hello, everyone! This epic game happened on Cockatrice, and I thought I'd share it with you. I decided to adopt Sheldon's style of reporting for when he writes articles about games with his friends, as it captures all the details involved in the game. Any feedback you can give is deeply appreciated! In this game I brought my Ninja deck. It has been updated with some C14 cards since the last time you heard about it. I hope you enjoy it! Grim: Plains. Tyler puts a Forest on the field. Krispy: Badlands. Tyler puts Misty Rainforest on the field. Me: Island, Glaring Spotlight. Tyler puts Gaea's Cradle on the field. Raizen: Sunken Ruins, Sol Ring. Tyler puts Vesuva copying a Forest on the field. Tyler: Rath's Edge, sacrifices the Rainforest for a regular forest (39) and casts Titania, targeting Misty Rainforest. Raizen: Windswept Heath for Breeding Pool (37), casts Oracle of Mul Daya, revealing a Wurmcoil Engine in the top, plays Volrath's Stronghold from hand. Tyler: Doubling Season, sacrifices Misty Rainforest for a Forest, gets two Elemental tokens, casts Garruk Wildspeaker and untaps a forest and Gaea's Cradle (4), casts Rites of Flourishing. In case you haven't been doing the math, Tyler had just played his entire hand by turn 3. Grim: plays two Plains and casts Celestial Kirin. Me: Shizo, Death's Storehouse and Underground River. I had two ninjas in my hand to follow Quag Vampires, but decided not to attack because I didn't want to make enemies so soon (my hand was not that good) and Tyler's board was just calling for a reset button, and I didn't want my ninjas caught in the crossfire. Raizen: reveals a Vampiric Tutor and a Twincast from the top, casts Phyrexian Metamorph (35) copying Titania, returning Windswept Heath from the graveyard. Sacrifices Heath for a Forest (34) and is now revealing Brainstorm in the top. Attacks Krispy with the Oracle (38). Tyler: Sacrifices a forest to Rath's Edge, targeting Raizen (33), casts Life from the Loam, which Krispy Dissipates. Plays Dust Bowl, uses Garruk to untap Gaea's Cradle and a Forest (5), sacrifices a Forest for Dust Bowl, targeting Badlands. Attacks Grim (35) and Krispy (33) with two Elementals. Grim: plays two Plains, casts Innocence Kami, destroying all Titanias and Doubling Season. Attacks Garruk with Celestial Kirin (2). Krispy: plays Temple of the False God and Forest. Raizen: reveals Mikaeus, the Unhallowed and Mulldrifter from the top, casts Brainstorm, reveals Overgrown Tomb, Cultivate and Bojuka Bog from the top, puts back Mikaeus and Tomb. Plays Tomb from the top, casts Cultivate, putting an Island on the battlefield and a Swamp on hand, is now revealing Clever Impersonator from the top, plays the Swamp, targets Phyrexian Metamorph with Volrath's Stronghold. Tyler: plays Dark Depths, untaps Gaea's Cradle and a Forest with Garruk (3), casts Sunstone (his forests were all snow-covered), casts Titania, returning Misty Rainforest to the field. Sacrifices Rainforest for a Forest (37). Attacks Krispy with six Elementals (just what I've been expecting)! 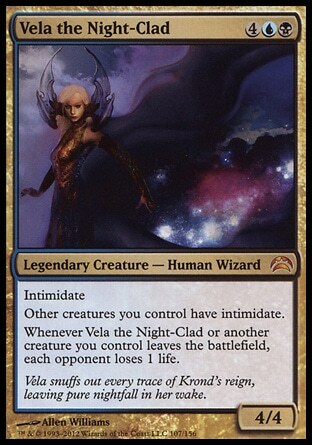 I cast Domineering Will targeting Krispy, Titania, an Elemental token controlled by Tyler, and Oracle of Mul Daya. They all die since they are forced to block, and Tyler loses two attacking Elementals. Krispy goes to 18 life. Sacrifices Dark Depths to Dust Bowl, targeting my Underground River. At EOT, Grim casts Pure Intentions, destroying Glaring Spotlight, Quag Vampires (leaving me with an empty board) and Sol Ring. 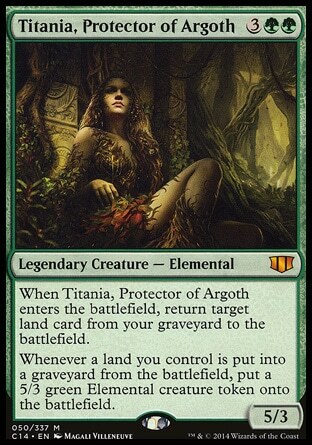 Grim: plays two Plains, attacks Garruk with Kirin; Tyler sacrifices a Forest to Sunstone to prevent the damage. 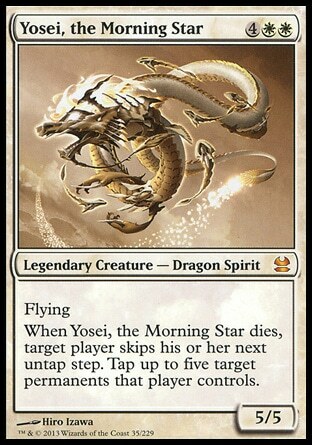 Casts Yosei, the Morning Star. Krispy: Casts Mana Crypt and Timetwister (only in Cockatrice could these two cards be played on the same turn ). Plays Ancient Tomb and Tropical Island, casts Elixir of Immortality and Perilous Vault. Ancient Tomb deals two damage (16). Me: play Swamp and River of Tears, casts Augury Owl, putting a card on bottom. Raizen: plays Island and Swamp. Attacks Garruk with an Elemental token. Tyler is tapped out and Garruk leaves. Casts Cultivate, putting a Forest on the field and an Island in hand. Tyler: Casts Summer Bloom, plays two Forests, Mikokoro, Center of the Sea and Reliquary Tower, casts Titania, plays another Forest. I'm suspecting he didn't attack because Yosei was freaking him out. He was the main threat at the moment after all. Grim: plays two Plains (as usual), casts Kami of the Painted Road, destroying Innocence Kami and Titania. Again. Casts Terashi's Grasp on Perilous Vault with Candles' Glow spliced on it and targeting Krispy; Celestial Kirin destroyed both Sunstone and Rites of Flourishing. Kirin attacks Krispy, gaining Grim 3 life (43). Krispy: Mana Crypt deals 3 damage to him (13), casts Windfall. In response, Raizen casts Crop Rotation, sacrificing a Swamp and searching for Bojuka Bog, targeting Tyler; I cast Recoil on Gaea's Cradle, and Tyler discards it. Raizen has the most cards in hand (6), and Windfall resolves. Plays Tower of the Magistrate and casts Phyrexian Metamorph, copying Yosei, casts Grim Monolith and Telepathy. Raizen: casts Bane of Progress. In response Krispy activated Elixir of Immortality before, gaining 5 life (18). 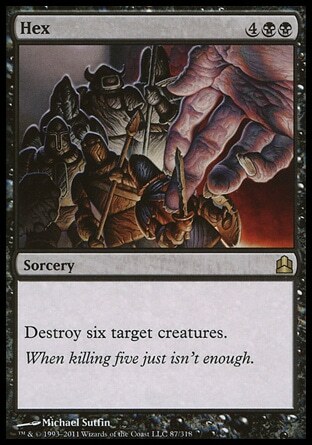 Six permanents were destroyed, including Telepathy. Casts Nature's Lore for a Forest, casts Life From the Loam, returning Swamp, Island and Misty Rainforest, plays Island. Tyler: Casts Lotus Cobra, plays and sacrifices Misty Rainforest, casts Crucible of Worlds, activates Mikokoro, sacrifices a Forest for Dust Bowl to destroy Temple of the False God. Grim: Plains, Honden of Cleansing Fire, Genju of the Fields. Me: Vela the Night-Clad. Attack Grim with Ashling (since only I can attack him and avoid triggering Yosei) (39), he sacrifices Celestial Kirin. Play Watery Grave. Raizen: Ancient Tomb, Kokusho, the Evening Star, Acidic Slime targeting Crucible of Worlds. Attacks Krispy with Bane of Progress and an Elemental token. Krispy targets Bane with Path to Exile and blocks the Elemental with Yosei. Yosei targets Tyler and all his Elementals and Raizen searches for a basic land, but he has none left! Tyler: Ghost Quarter, activates it targeting one of his own forests just to cast Sylvan Scrying, which gives him Maze of Ith. Grim: goes to 41 life thanks to Honden, Plains, activate Genju five times (which basically gives it five lifelinks), attacks Krispy with it (16 vs. 51). Me: attack Grim with Ashling (47), he sacrifices Kami of the Painted Road. Play Reliquary Tower. 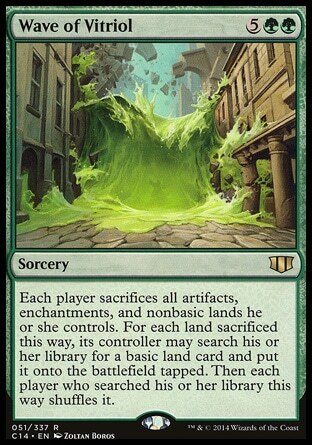 Raizen: Swamp, Eternal Witness targeting Duplicant (it was previously discarded by Windfall). Casts Duplicant targeting Yosei, but Krispy saves it with Tower of the Magistrate. It is at this moment that me, Raizen and Tyler vow to kill Krispy. Tyler: attacks Krispy with all his creatures, Queen makes a token and both block two Elementals; Maze of Ith saves one of the tokens and Krispy goes to 2. Casts Expedition Map. Grim: goes to 49 life, Yosei attacks Tyler (31), then casts Final Judgment in an attempt to save Krispy. Sadly for him, Vela seals his fate, and Krispy is wiped out of the game. Everybody else loses 3 life (Tyler 28, Grim 46, Raizen 30). Casts Celestial Kirin. Me: Rogue's Passage, Vela. At EOT, Raizen casts Teferi, Mage of Zhalfir. Raizen: Misty Rainforest, Fact or Fiction. He reveals five very dangerous cards and gives them to me. I put Clever Impersonator and Consecrated Sphinx on one pile and Damnation, Counterlash and Rite of Replication on another. He chooses the creature pile and casts Consecrated Sphinx. Attack Tyler with Teferi (25). At EOT, Tyler Expeditions for a Tower of the Magistrate and activates Mikokoro. Raizen refills his hand with the Sphinx. Tyler: it becomes clear that Raizen is gaining too much power, so Tyler makes the bold, but wise, move of casting Wave of Vitriol. In response, Tyler activates Volrath's Stronghold targeting Silent-Blade Oni. Because Raizen has no more basic lands in his deck, his mana base was reduced from fifteen to a mere seven lands. This is why you should always pack your decks with basic lands, folks! Grim: Plains, casts Kami of the Palace Fields, destroying Vela (Tyler 24, Grim 45, Raizen 27) and Sphinx with Kirin, casts Horizon Seed, destroying Teferi. All the players' boards are now clean except for Grim. Attacks me with Celestial Kirin (37). This was the first time I was attacked this game, on turn 10. Not bad! Me: Thada Adel, Acquisitor and Glen Elendra Liege. Raizen: dredges Life from the Loam during the draw step. Command Tower, Coercive Portal. He discarded Watery Grave during the cleanup step. Tyler: Thespian's Stage, Nissa, Worldwaker. Nissa animated a Forest. Grim: Untaidake, the Cloud Keeper, Hikari, Twilight Guardian. Nissa was destroyed and Horizon Seed regenerated. Cast Slumbering Tora. Me: attack Tyler with Liege (22) and Raizen with Thada (24). Steal and cast Mind's Eye. However, I noticed other very dangerous stuff in his library, so I cast Earwig Squad targeting Raizen and exiling Prophet of Kruphix, Forbid and Mikaeus, the Unhallowed. Raizen: me and Grim voted homage, so Raizen drew a card. I drew two cards with Mind's Eye. Cast Devastation Tide, Life from the Loam targeting Bojuka Bog, play Bojuka Bog targeting Grim, cast Reanimate targeting Wrexial, the Risen Deep in my graveyard (18). Discarded Rhystic Study during cleanup. Tyler: cast Titania targeting Ghost Quarter, play Wooded Foothills, targets his own Forest with Quarter, searching for another, sacrifices Foothills, and gains three Elemental tokens. Attacks Grim with the animated Forest (41). Grim: cast Celestial Kirin using Untaidake (39), casts Horizon Seed, destroying Titania (poor Titania...), casts Kami of the Palace Fields, destroying Wrexial. Me: Dismal Backwater (38), Thada Adel and Djinn of Infinite Deceits. Tyler: he finally casts Craterhoof Behemoth that has been waiting patiently in his hand for a long time and obliterates Raizen. Plays Wasteland and copies Untaidake with Thespian's Stage. Grim: Shinen of Stars' Light, destroying Thada Adel, and Ghost-Lit Redeemer. Me: Soaring Seacliff, Vela the Night-Clad. Tyler: Tower of the Magistrate, casts Titania using Untaidake (19), repeating the same old shenanigans with Ghost Quarter, destroys my Dismal Backwater with Wasteland. Attacks me with three Elementals, a Forest and Behemoth (which I block with Djinn). I go to 19. Casts Azusa, Lost but Seeking and plays Okina, Temple to the Grandfathers and Oran-Rief, the Vastwood, emptying his hand. Grim: casts Hikari, Twilight Guardian (guess what, Titania ), Kabuto Moth and Slumbering Tora. At EOT I use Djinn to switch the control of Ghost-Lit Redeemer and Craterhoof Behemoth, just as a safety measure. In response Grim taps the Redeemer (41). 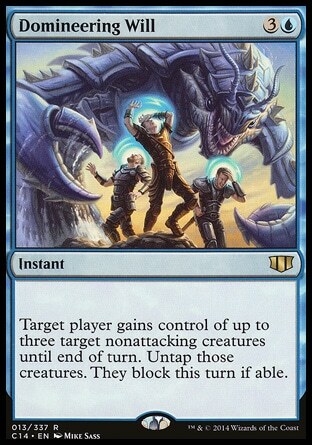 Me: AEther Gale targeting all Elemental tokens, Glen Elendra Liege, Dimir Aqueduct returning Soaring Seacliff to my hand. Attack Tyler with Vela (13). Tyler: Titania is summoned again, and returns Ghost Quarter again, which gives Tyler two more tokens again. Activates Oran-Rief, the Vastwood. Grim: Plains. Attacks Tyler with Hikari (7), putting him at enough life for me to kill him next turn. Me: attack Tyler with Vela and Liege, wiping him out. Grim gets Ghost-Lit Redeemer back. I cast Dire Undercurrents and Master Thief stealing Slumbering Tora. Grim: Plains (he has 18 lands by now, while I have only 12), attacks me with everything. I block Hikari with Djinn and Horizon Seed with Master Thief. Seed is destroyed and I go to 9. Casts Kami of Ancient Law and sacrifices it to destroy Dire Undercurrents. Me: Drowned Catacomb, Hex, targeting all of Grim's creatures. Grim casts Blessed Breath on Celestial Kirin, which triggers Hikari and exiles it. Kami of the Palace Fields soulshifts into Horizon Seed, and everything else is destroyed. Cast Hands of Binding targeting Kirin and ciphering it to Vela. Attack with Vela, Liege and Master Thief; Master Thief Ninjutsus into Ninja of the Deep Hours. Grim goes to 30 life. Grim: I give thanks to Djinn of Infinite Deceits. If it wasn't for him, I would've lost to a topdecked Charge Across the Araba. Attacks me with Hikari, I block with Djinn, casts Charge, returning four Plains, and Djinn is destroyed. Casts Horizon Seed. Me: play Tectonic Edge. Attack with Vela, Liege and Ninja of the Deep Hours. Ninjutsu the Ninja with Throat Slitter, which destroys Hikari at last. Grim goes to 19 life, Hands of Binding keeps the Kirin pinned down. Cast Master Thief, stealing Slumbering Tora again. Me: Attack with everything. Grim goes to 5. Hands of Binding keep the Kirin controlled, and Throat Slitter destroys Horizon Seed. I have a hard time remembering what happened three turns ago... How the hell do you manage to recap an entire game turn by turn? Are you part Vulcan? Do you make a habit of filming your games to watch again later? Or do you have some kind of secretary to keep a log? 'Cause that would be really usefull in our games, it would end a lot of heated discussions. "No, I'm sorry Nigerian Prince, you clearly stated five turns ago that you considered tutoring lame and close to funwrecking, so by general consent your Demonic Tutor fizzles!" He said it was done on Cockatrice, which is an online playground (so to speak) for Magic. It records everything which occurs in a match, making it easy to form these kinds of reports. Ah, that makes sense, never heard of Cockatrice (Except that little green lizard).